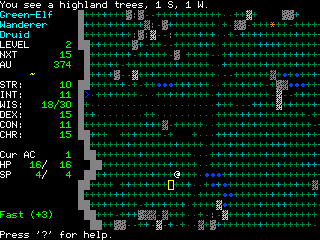 First Age Angband is a roguelike game, a variant of Oangband, which in turn is a variant of Angband. On the first launch the game must create "race_probs" file, it takes about 40 sec. * Races have been significantly changed. * There are multiple towns. * There are multiple dungeons. * Anything from later than the First Age has been removed (artifacts, items, uniques). * There is no savefile compatibility with Oangband or Angband. ** Author of this port added knowledge of a danger level for every creature in the description.